Yes, please!! 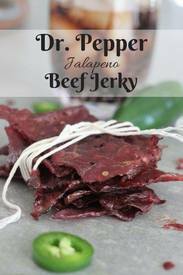 This Dr. Pepper Jalapeno Beef Jerky recpe from Hey grill Hey is legendary! This post includes steps on how to make beef jerky and the best beef jerky recipe ever. I mean, really. This post is so full of beef jerky knowledge, it should probably be a book. We are going to be talking cuts of meat, slicing tips, marinating basics, and dehydrating vs. smoking.